I maintain a small shop dedicated to the art and craft of building fine keyboard instruments. I have been building instruments for over 25 years. 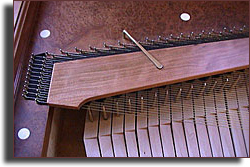 My focus these days has been on the clavichord and the pedal clavichord. As a musician, I am well aware of the tone and touch I desire in a musical instrument. As a builder, I know how to make that happen. The shop is well equipped to handle all restoration work including fine casework, gilding, and veneering. We gladly make associated furniture such as benches, music stands, and music desks. In addition to our instruments, we offer outstanding custom keyboards to the discriminating organ builder. Our keyboards are now playing in organs throughout the U.S.
For those in the Boston area, we are available for tuning and maintenance of all your instruments including pianos, harpsichords, organs, and of course, clavichords.